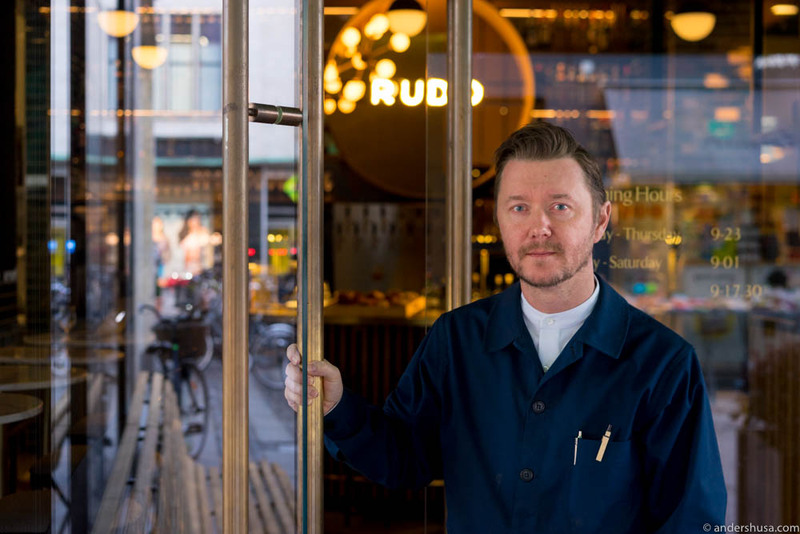 Rudo has a magnificent facade and main entrance towards Pilestræde in Copenhagen’s inner city, with huge brass-colored letters forming the logo, green awnings and the light from multiple light spheres shining through the large windows. 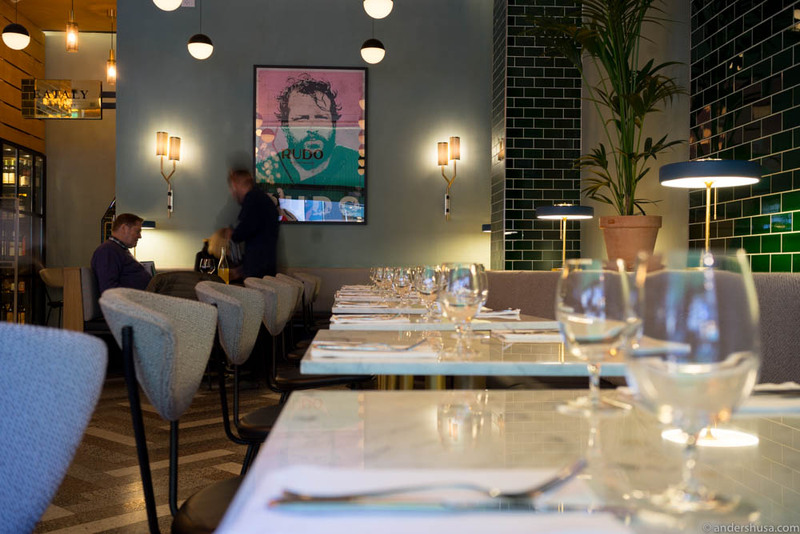 The newly opened Italian style aperitivo bar and restaurant is connected to Illum Shopping Center, and also has direct access to the new Eataly food market in the basement. You can go here for breakfast, lunch or dinner to enjoy an Italian inspired menu and cocktails based mostly on Vermouth – the fortified wine flavored with botanicals. “The next wine glass is on me if you can guess the Wi-Fi-password,” Kim Rossen told me (hint: it’s “Vermouth”). 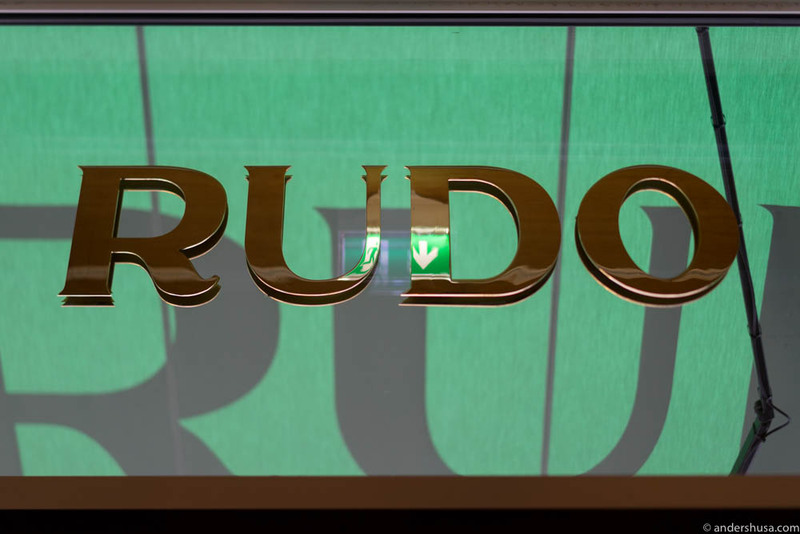 Together with his business partner, the Italian chef Christian Puglisi, his latest restaurant to open is Rudo. You may know Puglisi and Rossen already, or at least their other restaurants like Relæ, Manfreds, Bæst, and the sourdough bakery Mirabelle. While Relæ and Manfreds are strictly Nordic, both Bæst, Mirabelle, and now Rudo explore Puglisi’s Italian heritage. The common denominator for all of their places is high quality and authenticity (whether it’s Nordic, Italian, or a mix of the two) and more than anything they aim to use 100 % organic produce. The duo also own a wine importing company called Vinikultur, which is focused exclusively on natural wines. 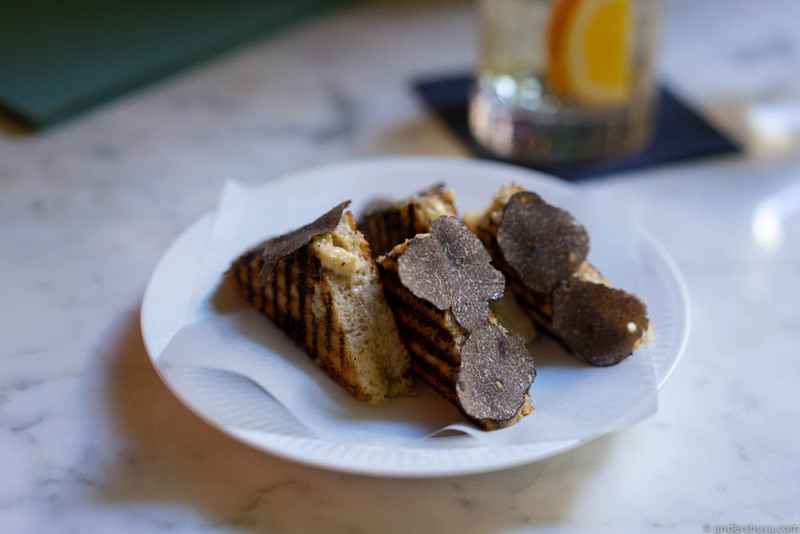 The burrata and black truffle toast is a must! I was in town for one day only, as I was invited to the press opening of Copenhagen’s latest and largest food market Westmarket. Rudo was my top priority to explore on my own, and thus my first stop of the day. I came around brunch hours and grabbed a table next to the window. Browsing the menu, I quickly decided that the burrata and black truffle toast was a must (and I can assure you it was!). Rossen came over to explain the menu and also recommended the tartare – a twist on the Manfreds classic, but served with mushrooms and parsley. I resisted the antipasti only because I figured I had already tried the home-cured hams at Bæst. Furthermore, Kim suggested a brunch cocktail, which I thought was a great idea. Fresh and fruity, Vermouth-based, and topped with “danskvand” to reduce the sweetness. Highly refreshing! The tartare was delicious too, and I actually preferred it to the more simple Manfreds version. Topped with thinly shaved mushrooms, a dusting of mushroom powder, and mixed with a mushroom emulsion that all added umami taste to the delicate, shredded pieces of raw meat underneath. Just when I thought it couldn’t be any better, Rossen came over with two slices of Mirabelle’s delicious sourdough bread – crispy and almost burnt on the edges – to scoop up all the sauce. Of, course, I couldn’t resist ending my meal with the homemade gelato on raw Jersey milk – an elegant, soft and creamy finish! The retro Italian cocktail menu is developed in cooperation with the world-champion bartender Hardeep Rehal. Rossen proudly showed me their large collection of Vermouth on the bar shelves but was particularly pleased when he pulled out a vintage bottle of Martini Bianco from the 1960s – dark brown and golden in color. 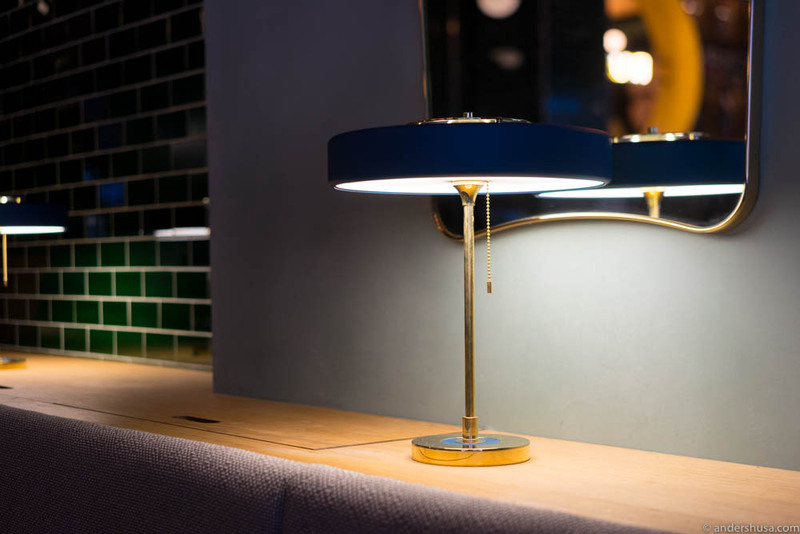 The interior design looks like sleek hipster Scandinavia just met retro Italy and fell in love – with shiny black tiles on the wall, white marble tables, and wood and brass details all over. Spaghetti Western movie star Bud Spencer is heavily featured in the restaurant. His image is painted on an entire wall, as well as filling two pictures frames – one in the dining room and one in the restrooms. Grazie, Bud, and thanks, Rudo! 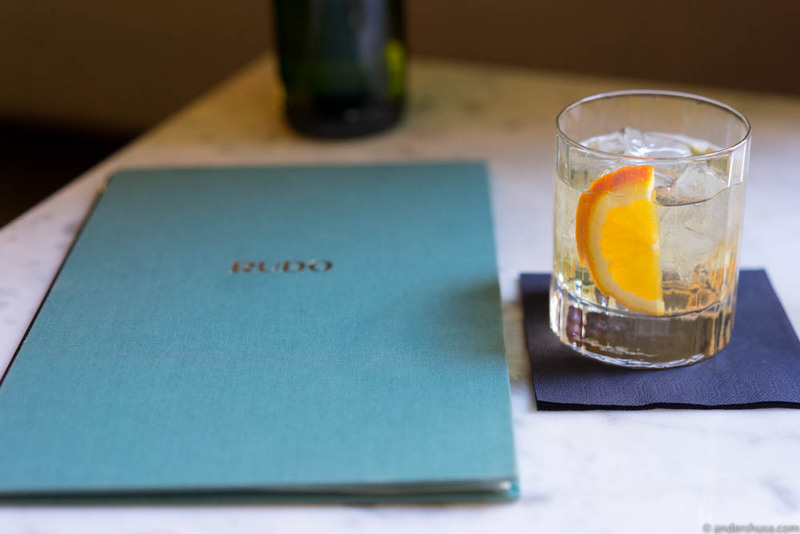 Fun fact: The tradition of having an aperitivo, a bitter, pre-dinner drink with some snacks, started in Milan in Italy in the 1920s. In fact, the word is from Latin and means “to open” – as in opening or stimulating your appetite. Saluti! What’s your favorite aperitivo? Please share in a comment below. Please note: This restaurant has closed permanently.